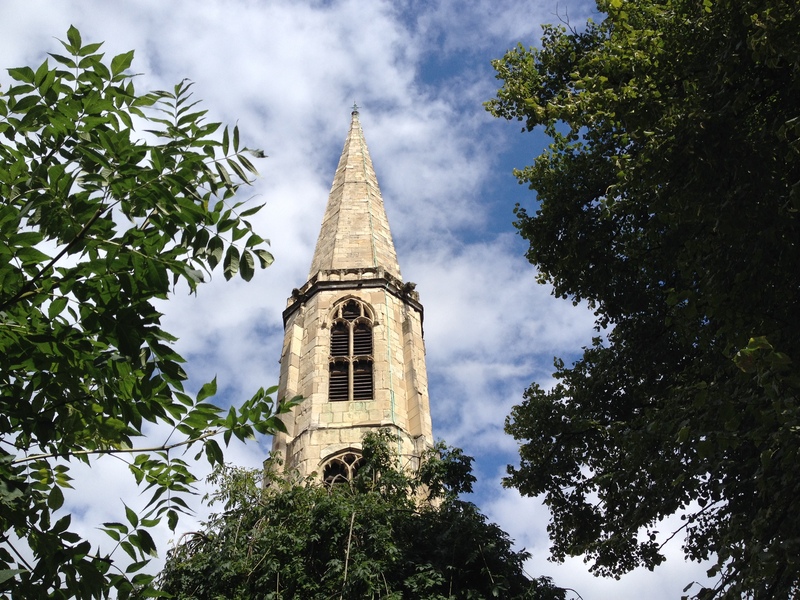 All Saints in the sunshine. At its core, archaeology is all about stories; capturing glimpses of bygone times in the material left behind by the people who lived through them. To hear these echoes we have to follow through a long process, beginning with research and excavation. Archives are trawled through, aerial photographs are pondered and historic maps are searched for hints of former land use. With a good knowledge of a site’s background, we call in the ground troops. Over the last two months, the Archaeology Live! summer team have been working to read the story of our little corner of land by All Saints Church, beginning as archaeologists always do – at the end. From the recent demolition of the old church hall, we have uncovered an unbroken sequence of activity dating back to the beginning of the 19th century. Photographs have been taken, plan drawings measured and detailed context cards have been filled in. We have worked out exactly what cuts into what, which dump overlies which surface and recovered finds to provide a date for each of these events. This combined effort is what forms the core of our story. We always remind our trainees that individual finds, while exciting, are only part of the bigger picture and that archaeology is certainly not a treasure hunt. That said, it is always nice when these things appear and every now and then a week comes around where you can’t move for amazing artefacts! The monday of week 8 marked the beginning of just such a week. There was a palpable buzz around the trench as the team began to arrive; the sun was shining, the trench was looking smart and we had everything to play for. In ‘This End’, Toby’s new arrivals and continuing trainees began work on a number of features. Returning trainee Reinhilde once again made the trip from Belgium to join us, this time with her nephew Gerwin in tow. The pair drew the difficult task of finding good edges in an area heavily disturbed by Victorian rabbit burrows. Happily, with some of ‘Toby’s trowelling top tips©’ they were able to identify a cut feature that could be another early 19th century grave. Gerwin and Reinhilde trowelling over new deposits. After recording their new context, Gerwin and Reinhilde began to excavate and it wasn’t long before they were rewarded with some amazing finds. A strong contender for the image on next season’s T-shirt was Gerwin’s sherd of a mid-16th century Bartmann jug. Also referred to as Bellarmine jugs, these stoneware vessels were produced in Germany throughout the 16th and 17th centuries. Almost ubiquitous in their decoration is the image of a bearded man. Gerwin’s sherd of a Bellarmine jug. 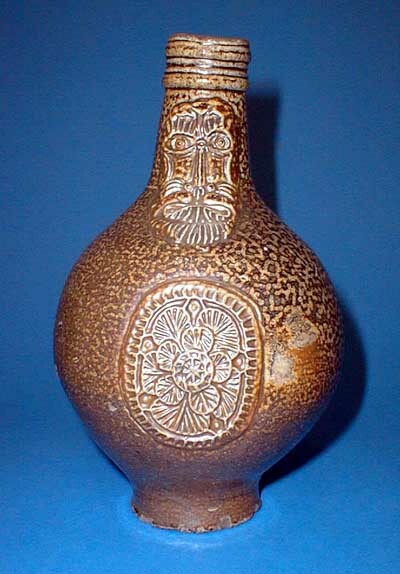 A popular image in European folklore from the 14th century, the ‘wild man’ appears on many artefacts, although Gerwin’s pot is more likely a representation of cardinal Robert Bellarmine (1542-1621). Opposing the rise of protestantism in Germany and the Low Countries, the use of his image on these vessels could well have been a form of ridicule from European protestants – especially when his staunch anti-alcohol stance is considered. A quick google search provides numerous images of complete examples. This is a fantastic find and would have been a colourful addition to any household. Reinhilde wasn’t left behind however and among a number of good finds, she discovered a large sherd of a flat bottomed Samian ware bowl. 1st-2nd century in date, this is a piece of high-status Roman tableware more familiar to olives than pottage! Found in such good condition, it is hard to fathom that this object is almost two thousand years old! 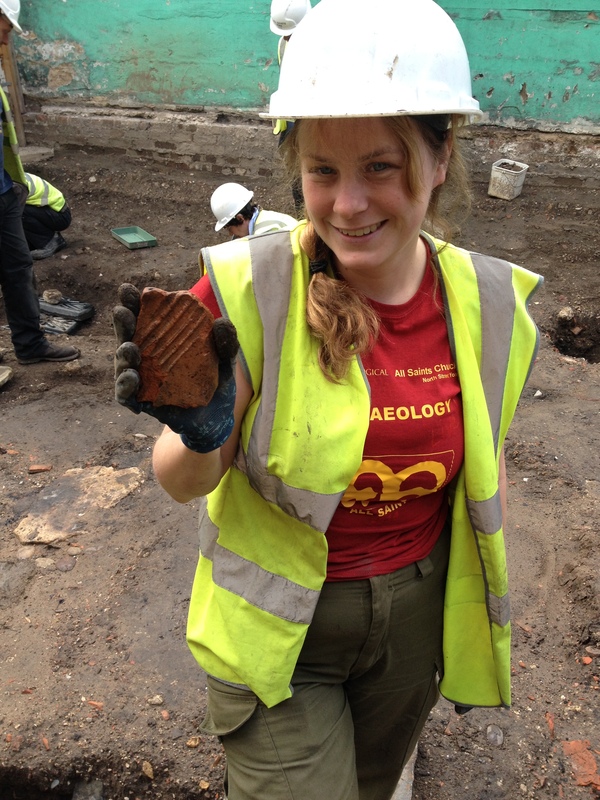 Reinhilde displays her freshly unearthed samian bowl sherd. New trainees Vicky and India also had a busy week in Toby’s area. 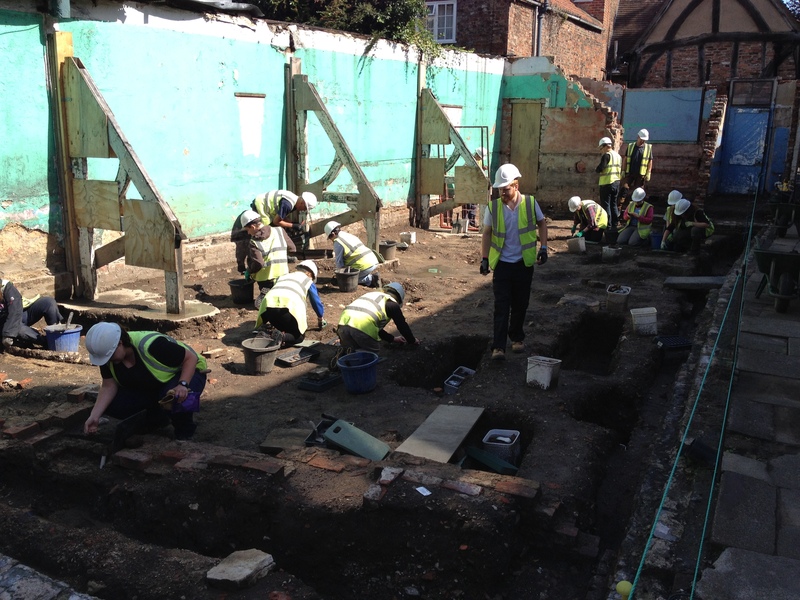 Alongside working on several dumps and a grave backfill, the pair worked together to record and excavate the backfill of a truncated brick chamber located between the rectory and Church Lane. Vicky and India working on their brick chamber. 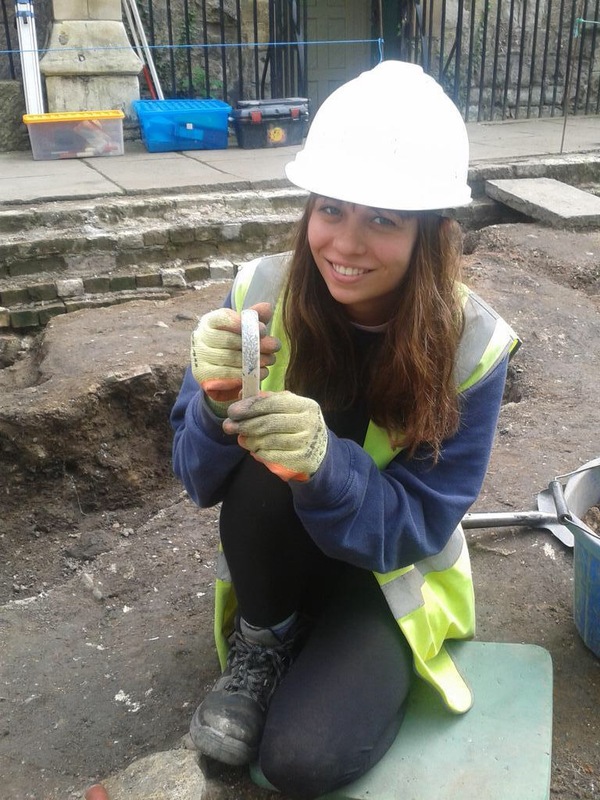 The backfill yielded some interesting artefacts including our second possible corset clasp of the season. Good to know the resident rector was an appreciator of ladies’ fashion! 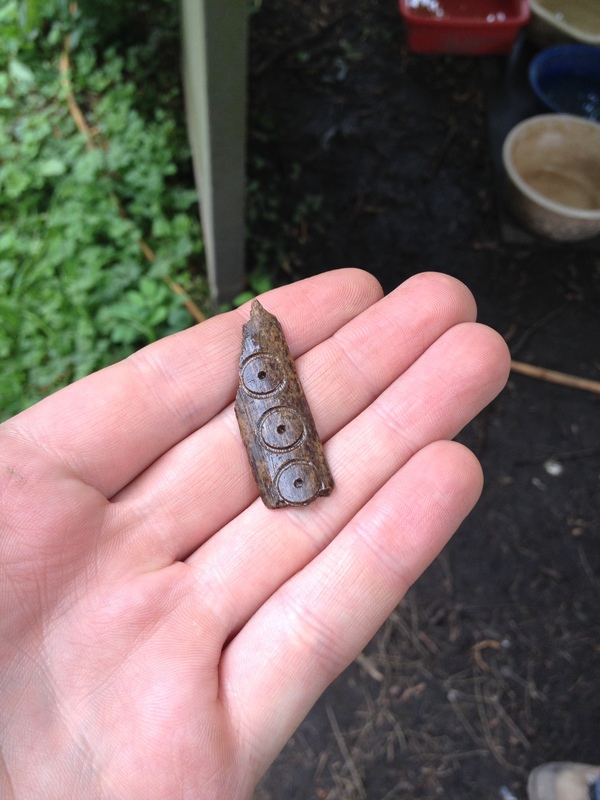 India found another fashionable object within a lump of metallic corrosion – a small, decorative copper button. Later in the week, India’s fashion collection was added to by a glazed ceramic button. Another smart item of clothing found close to the rectory. India and her ceramic button. Archaeology Live! 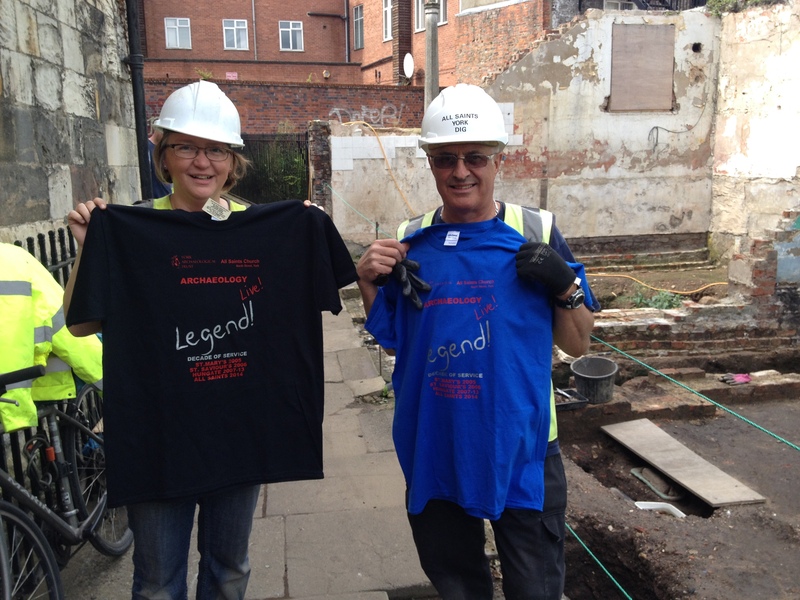 regular Kirsten Hald, alongside longstanding placement Dave ‘the dig’ Dearlove, achieved legend status this week after ten straight years of digging with us! Toby presented the pair with commemorative T-shirts to celebrate. Here’s to the next decade! True Archaeology Live! legends, Kirsten and Dave. 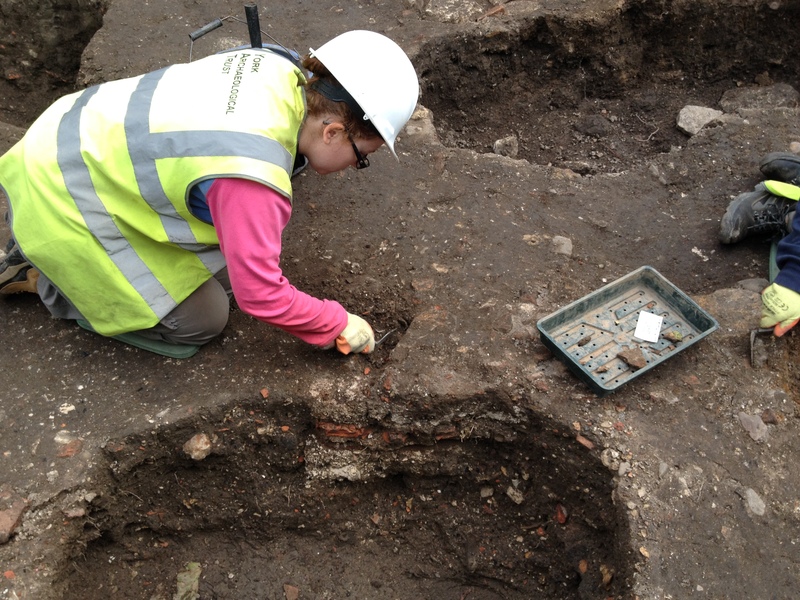 Continuing to work with Kaye, another Archaeology Live! 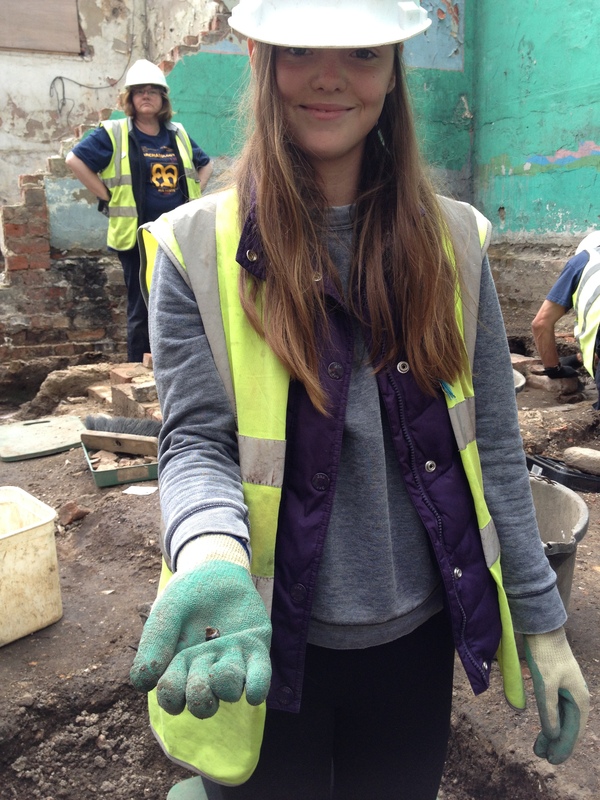 regular, Kirsten recorded and excavated a dump of cinder within a small annex of the rectory. 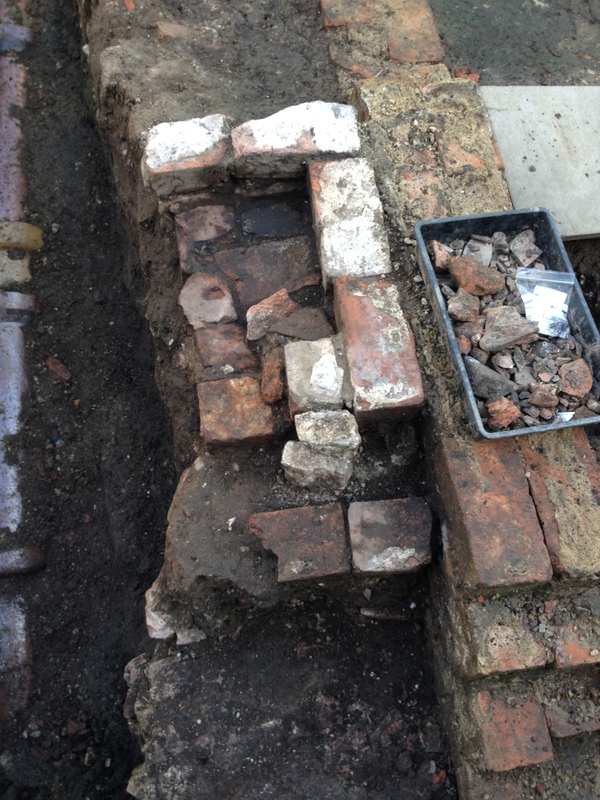 This backfill contained a good deal of late 18th to early 19th century pottery, including a fragment of a chamber pot. Fittingly, as things often do on Archaeology Live!, it turned out to be a cesspit. Kirsten and Kaye’s cobble-based cesspit is visible in the right of this shot. 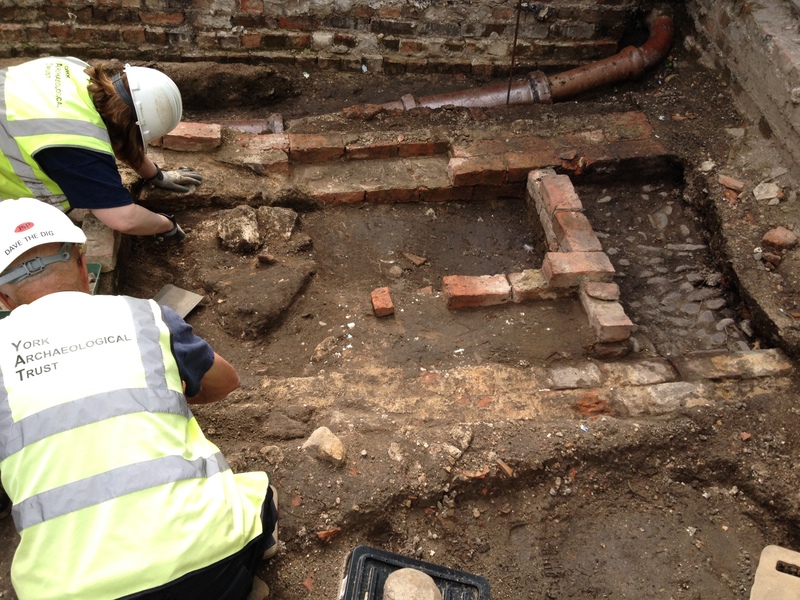 Lined with brick and complete with a well-mettled cobble floor, this cesspit was better built than Vicky and India’s example and provides an earthy insight into life in an early modern rectory. 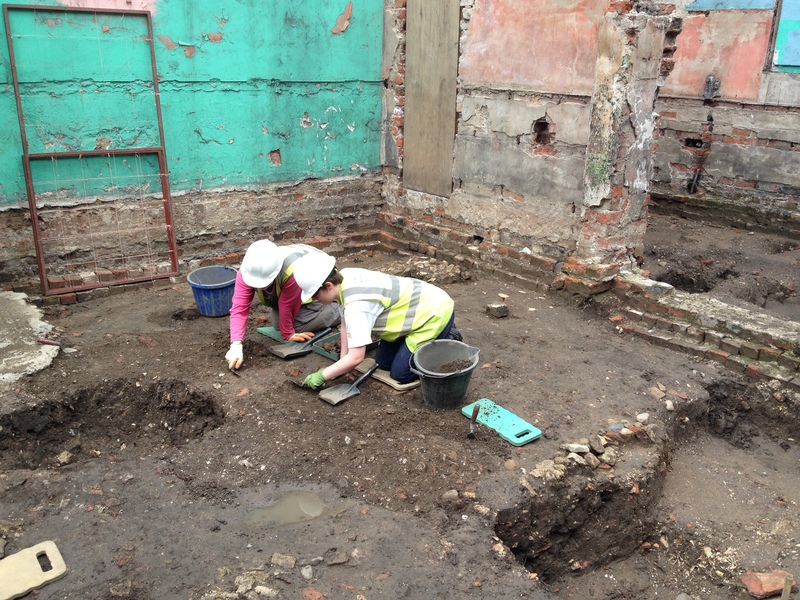 Kirsten and Kaye also exposed a small, truncated section of the rectory’s brick floor. The rectory’s north wall. A tale of two cesspits. 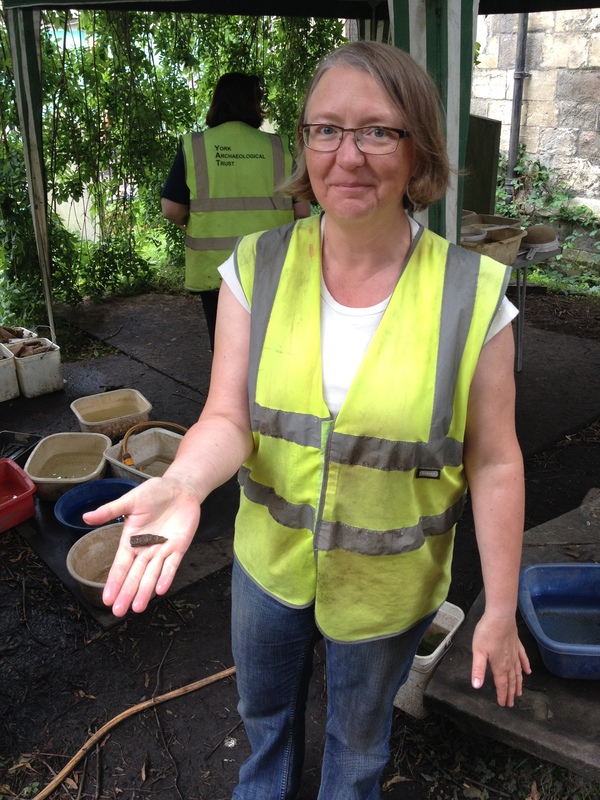 In keeping with the week’s theme of great small finds, Kaye was lucky enough to discover a particularly beautiful artefact – a fragment of a glass ring. We’ll need a specialist to give us a date for this one, although Toby, Arran and Gary are all in agreement that it looks distinctly Roman. If this is the case, this will go down as one of the year’s most significant individual artefacts. Being a glass object found in damp conditions, this object will be kept moist to arrest any possible drying out and subsequent decay. Over at ‘That End’, Gary’s team also enjoyed an eventful and finds-rich week. Continuing work on a 19th century grave cut, Rosie and Alan began their second week with the intention of cleaning up and recording the partially excavated feature with a view to it being picked up later in the season when access is easier and safer. 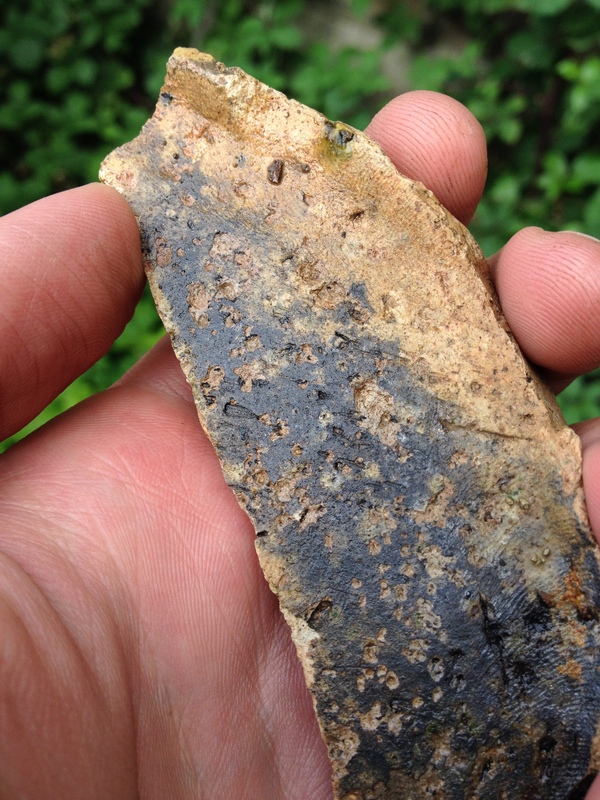 This clean-up produced a number of wonderful finds, including a sherd of a sizeable splash glazed pot. Dating to the 12th-13th century, this would have been a substantial vessel! Alan’s thumbprint decorated medieval pot rimsherd. However, the real star of the show was unearthed moments later. 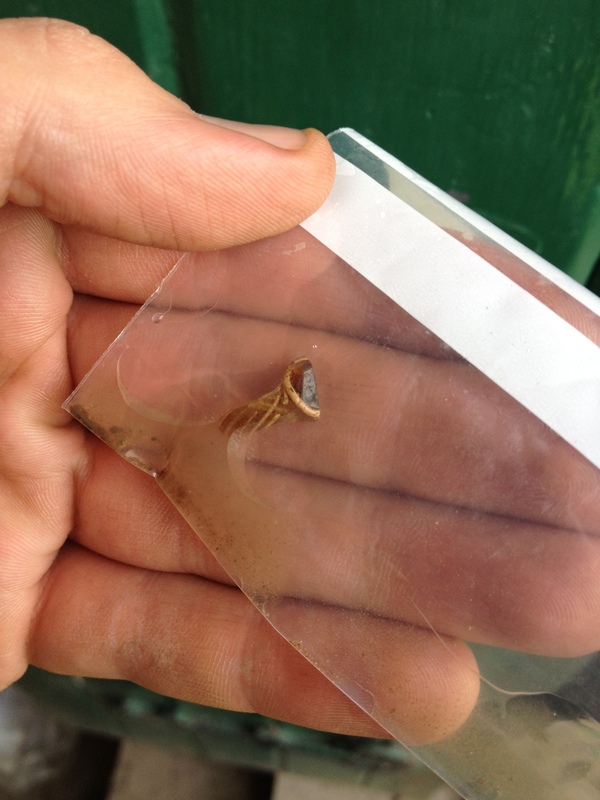 Alan spotted what appeared to be a very precisely curved fragment of bone. 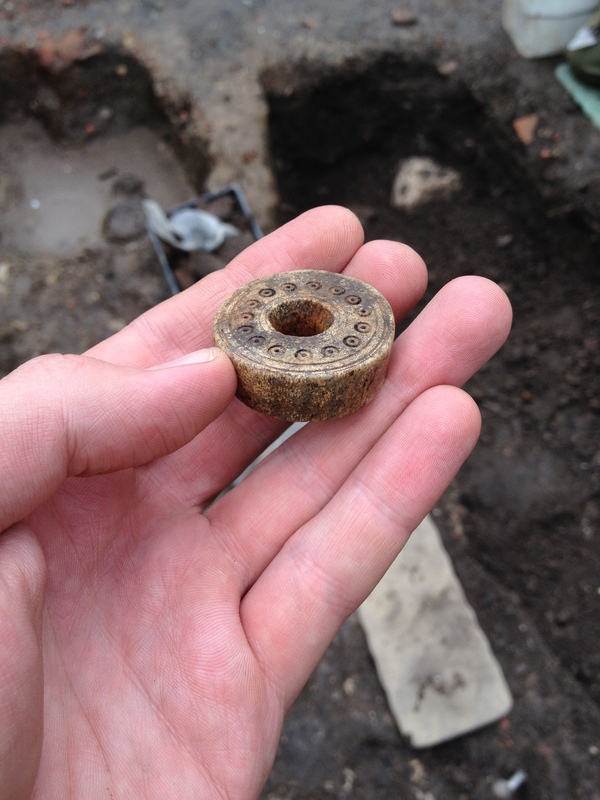 As it was revealed in its entirety, it proved to be a beautifully crafted antler spindle whorl. Used throughout the Viking and medieval periods, such objects were part of daily crafting life. 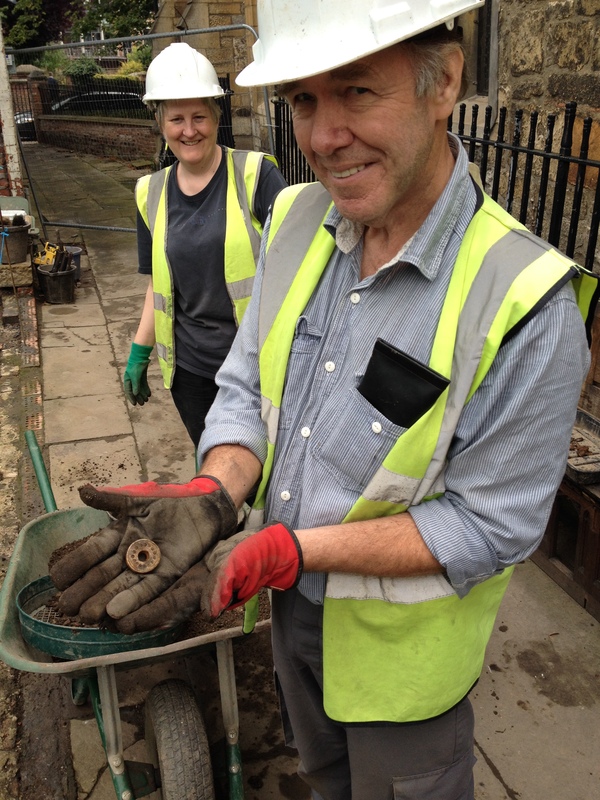 Alan looking deservedly happy with his latest find. While a date between the 10th and 12th century is as accurate as we can confidently say before specialist analysis, the circular incised decoration looks very similar to numerous Viking antler objects discovered on nearby Hungate. What can’t be doubted is the wonderful craftsmanship of this object, which would have been a valued possession and was almost certainly lost rather than discarded. 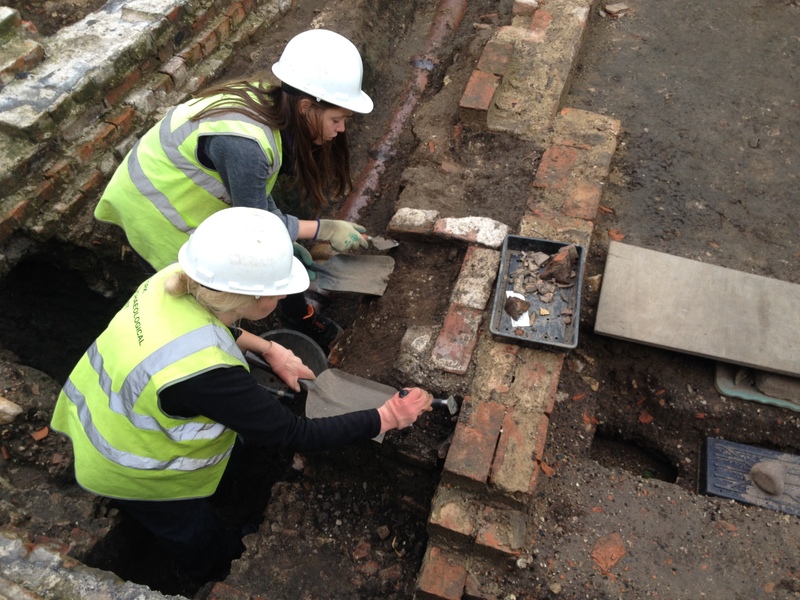 Later in the week, Rosie and Alan investigated a small, sub-rectangular refuse pit. 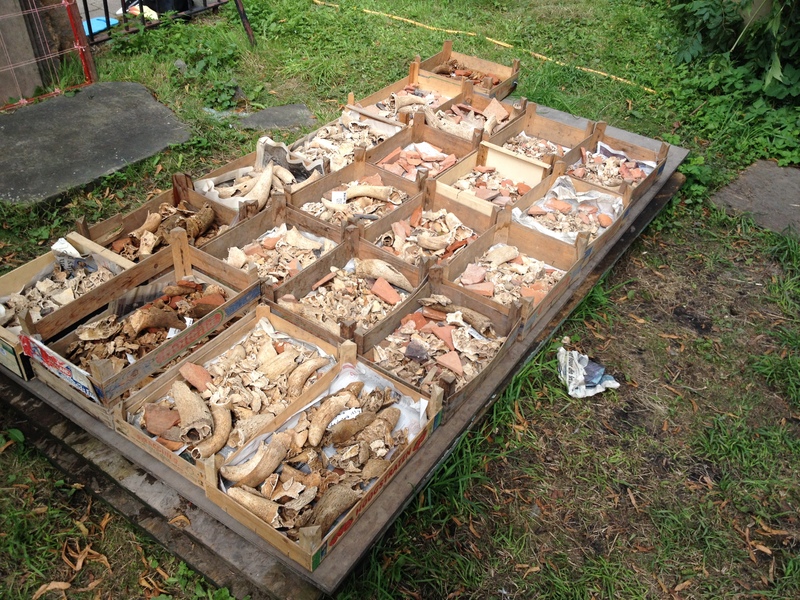 The finds proved to be the usual ‘That End’ pick n mix of Roman to post-medieval pottery, animal bone and ceramic building material. 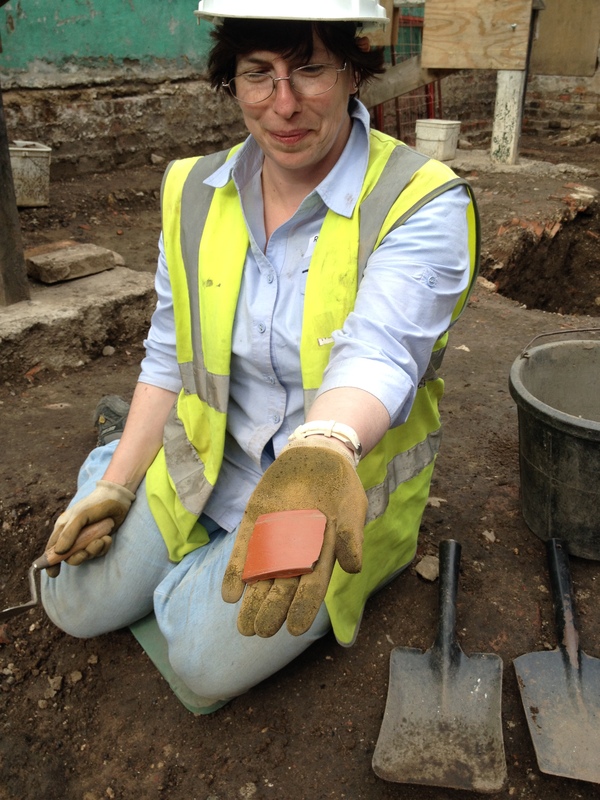 Rosie unearthed a large tile fragment, charred on one side and scored on the other. 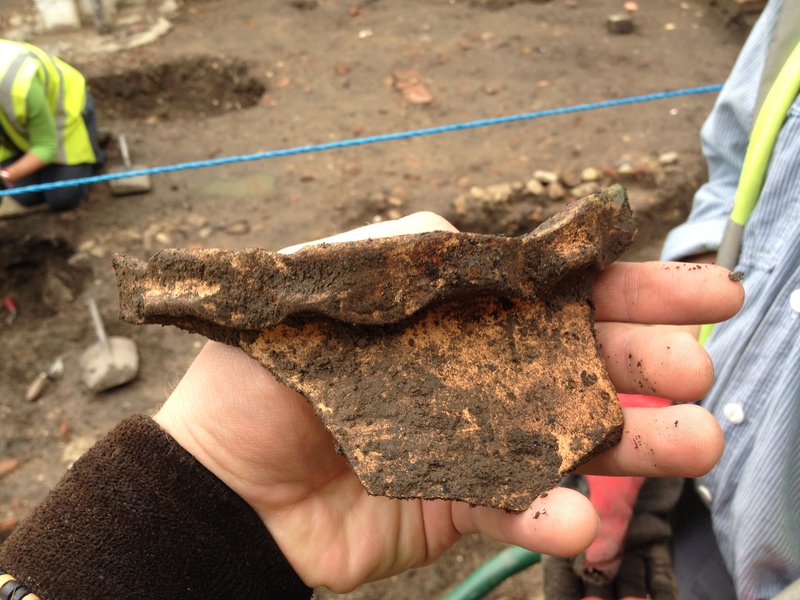 This could represent a fragment of flue tile from a Roman hypocaust (early under-floor heating!) and when this is considered alongside the many fragments of Roman tablewares and amphora found nearby, we have increasing evidence for consumption of luxury goods early in the first millennium. As excavation of the feature continued, the plot thickened. Alan and Rosie began to expose a layer of well-laid stonework. 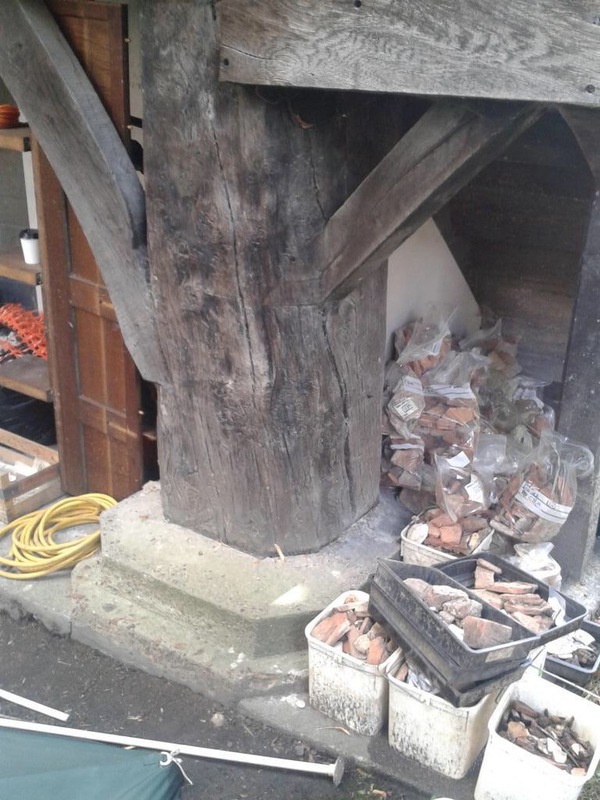 The assemblage of limestone blocks appears to be a substantial post-pad, designed to take the weight of a large structural timber. 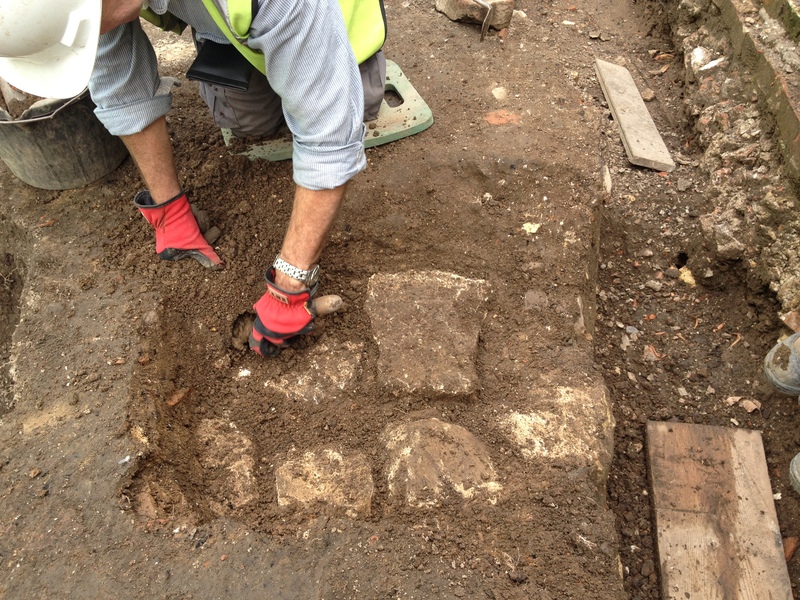 As the surrounding sequence is tightened up, it may be possible that this is the first definitive evidence that the neighbouring row of medieval buildings, All Saints Cottages, may once have extended further over our site. To provide a visual aid, the reconstructed early 20th century hermitage at the rear of the church features a large timber upright being supported, in this case, by a concrete post-pad. The hermitage at the rear of the church (currently a finds storage area). 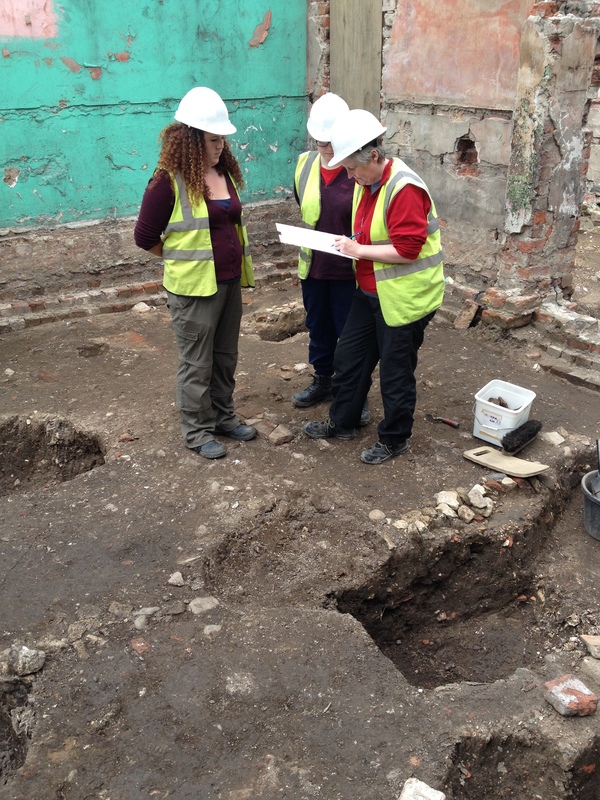 Elsewhere in Gary’s area, Sarah, Hannah and Beth recorded and excavated a rough yard surface. 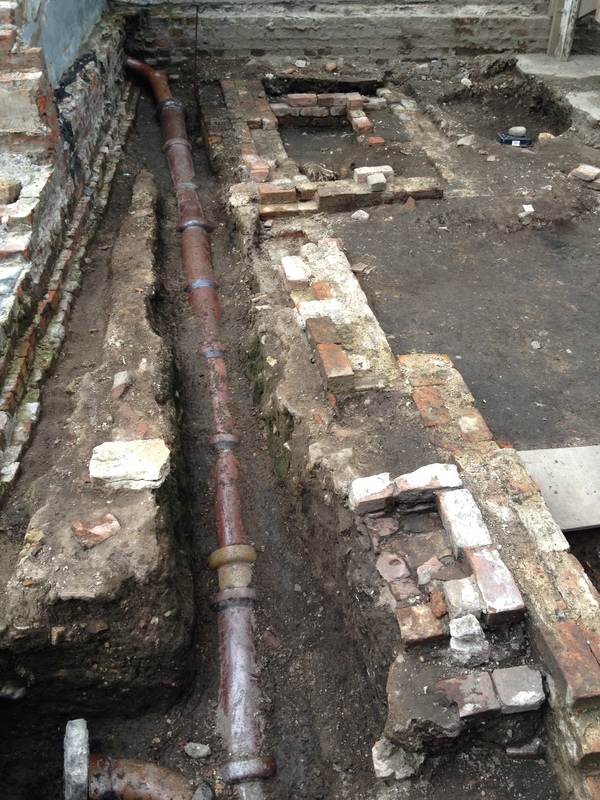 This revealed a complex, intercutting sequence of early 19th century pits. Beth and Hannah hunting edges. The yard deposit contained some more great finds, including the year’s second copper alloy lace tag (fashion being something of a theme this week). Sarah and her lace tag. 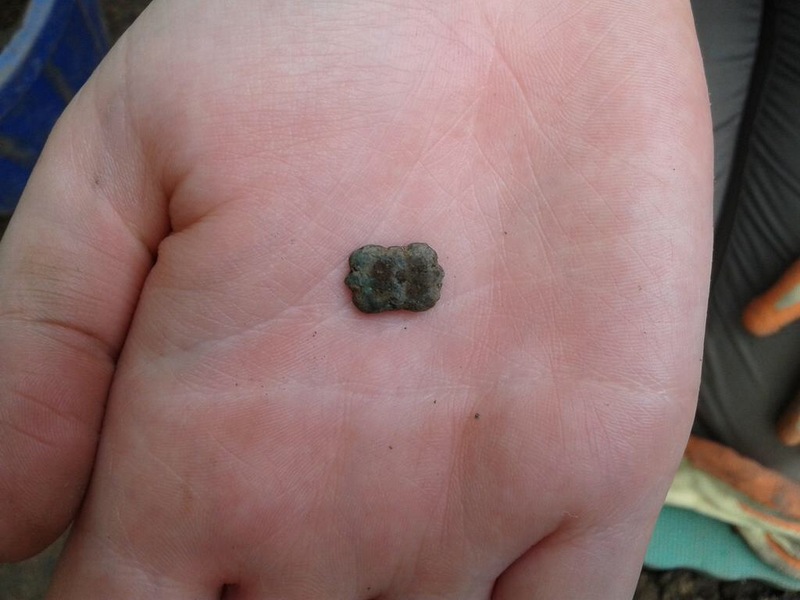 Beth unearthed a rather lovely copper alloy clasp/buckle. Again, appearing medieval in date, this find should clean up beautifully. A structural feature, exposed earlier in the season in the section of Biagio’s ‘bone pit’, proved to be less substantial than may have been expected. Only around 100mm in width, it now seems this feature has been almost entirely truncated by later pits. A structural feature is visible in the pit section. 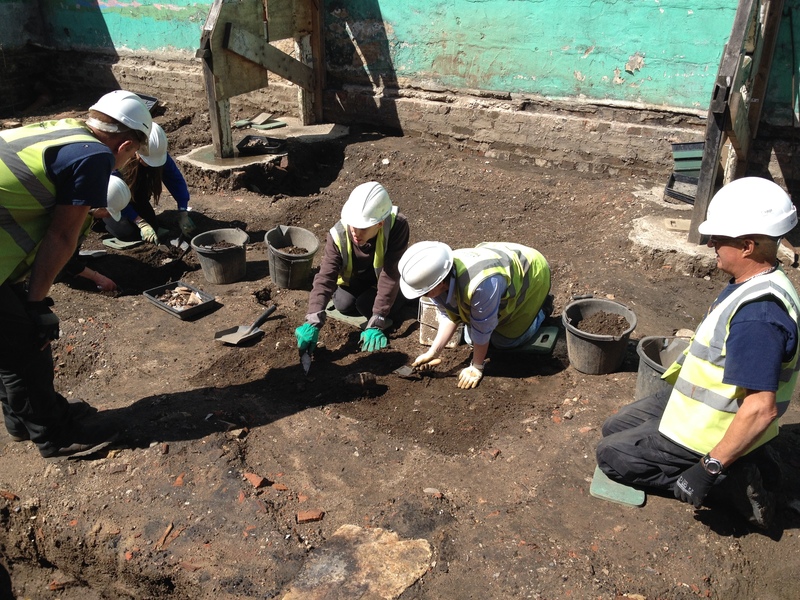 With a number of new pits identified, Gary’s team recorded the two latest examples and began to investigate them. Joining us on a two day taster, Emily worked with Beth on one of our pits. 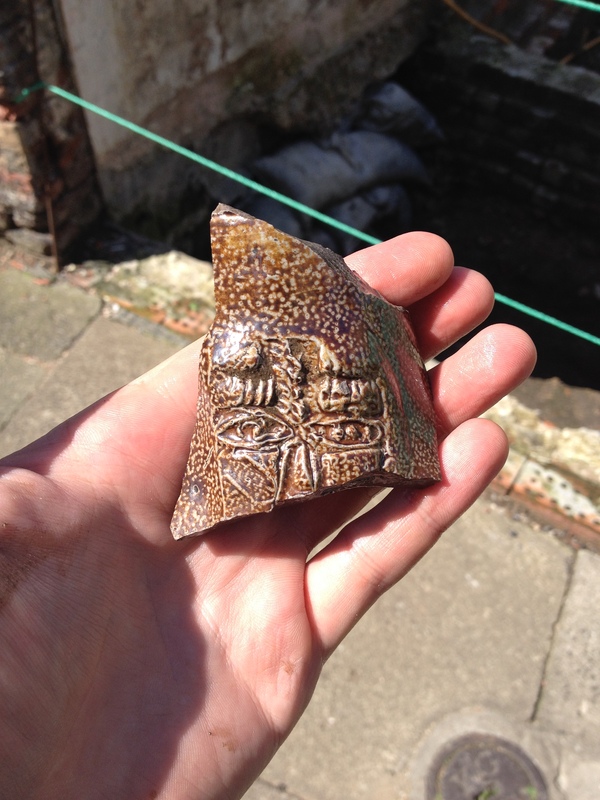 She was delighted to find the handle of an 18th century tin-glazed earthenware jug. 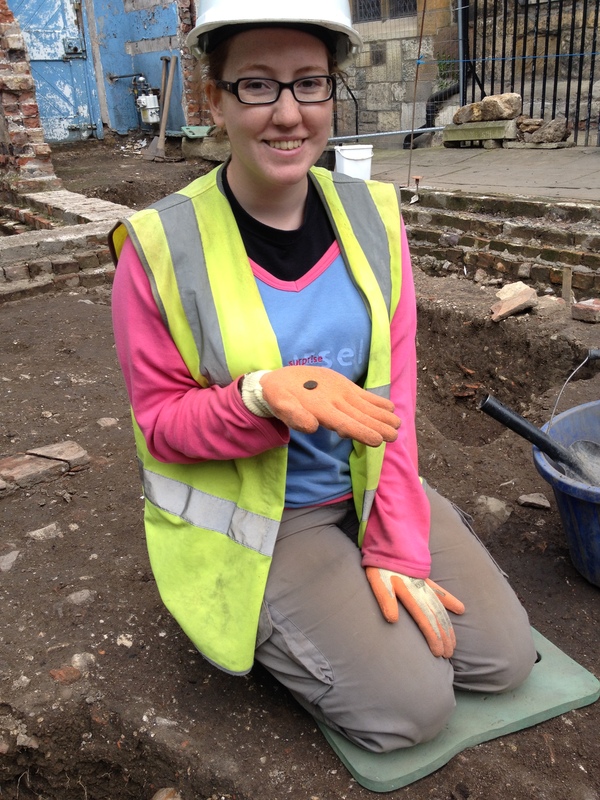 The same deposit turned up another good find for Beth, as she unearthed a corroded copper alloy coin. Cleaned up by our conservators, this should provide a good date for the pit. 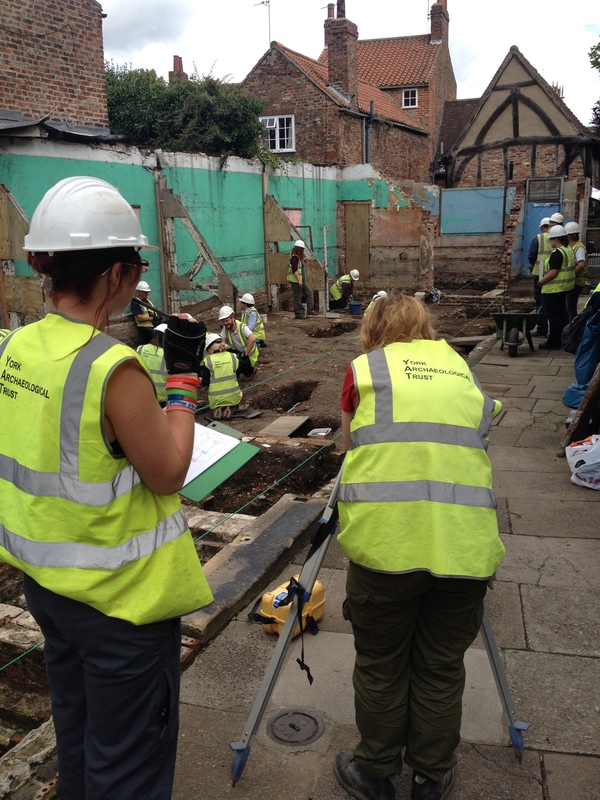 The new edges and pits unearthed by Gary’s team reveal an increasingly busy and well-used yard space that continues to contrast sharply with the sequence at Toby’s side of the trench. These will continue to be investigated next week, perhaps we will find more evidence of the tanning industry. 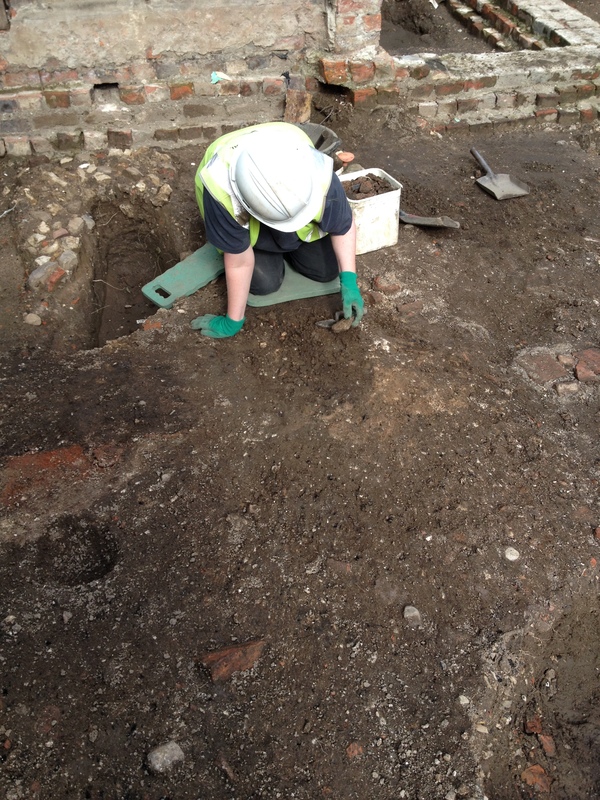 Sarah exposing a sub-circular pit. Just SOME of the bone from context 1152. Thankfully, a few earlier artefacts were found among the mass of early 19th century cattle crania and horn core. These included a fragment of medieval pottery complete with the perfectly preserved fingerprints of the potter. The ridges of each fingerprint are clearly visible in the fabric of the pot. Medieval fingerprints in vivid detail. 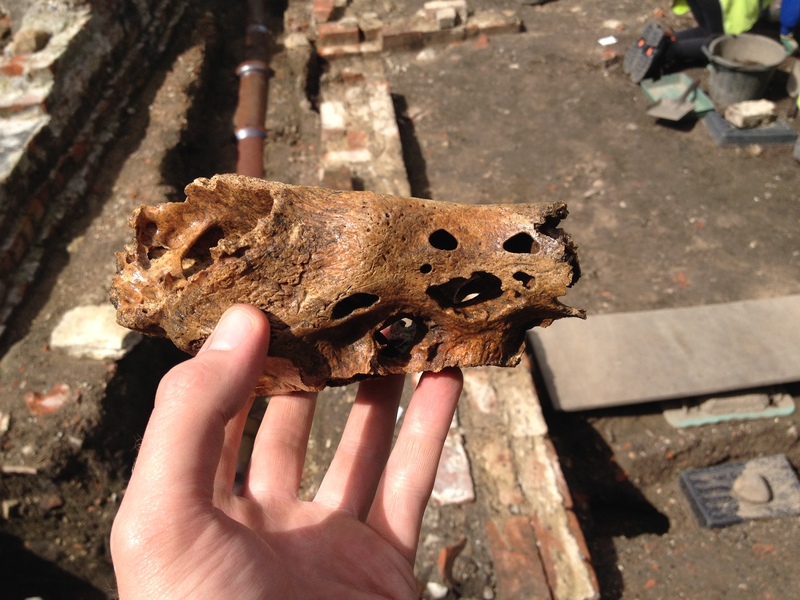 One fragment of cattle skull provided evidence of a rather unhealthy cow, as the skull was peppered with holes. These represent damage caused by tumours and would have made for a rather unhappy beast. Washing what appeared to be a fragment of cattle rib, Kirsten spotted some unusual markings in the bone. Kirsten marks her decade of service with another top find! Closer inspection revealed the object was not bone after all. Instead, it was a thin panel of decorated antler, incised with circular markings. Possibly the exterior of a Viking composite comb, this find proved that finds washing can be exciting at the most unlikely times! 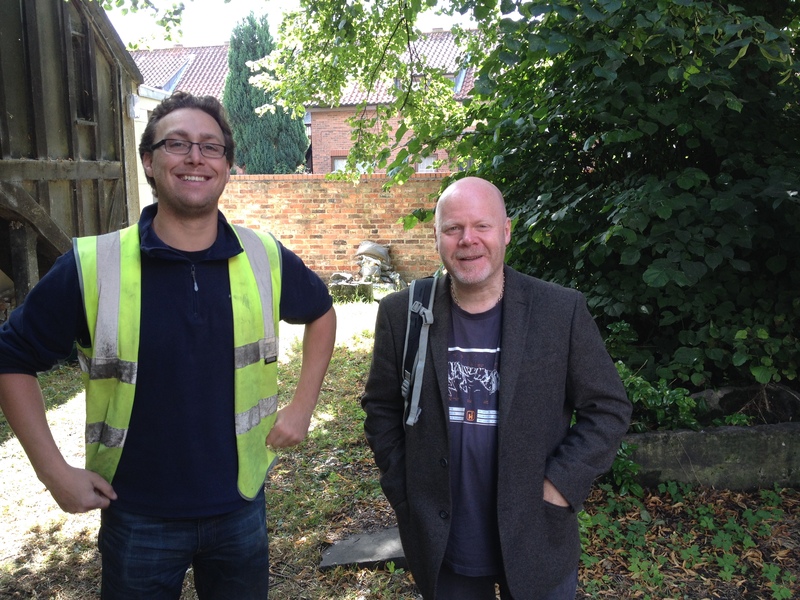 An unexpected pleasure was a site visit from Lewis Gell, the former owner of the boxing club, under which we are currently digging. Lewis had many good stories of his time in the building and will be providing us with some photos of the boxing club in its former glory. We’ll post a more detailed blog post on the club’s recent history in the coming weeks. Gary and former boxing club owner Lewis. 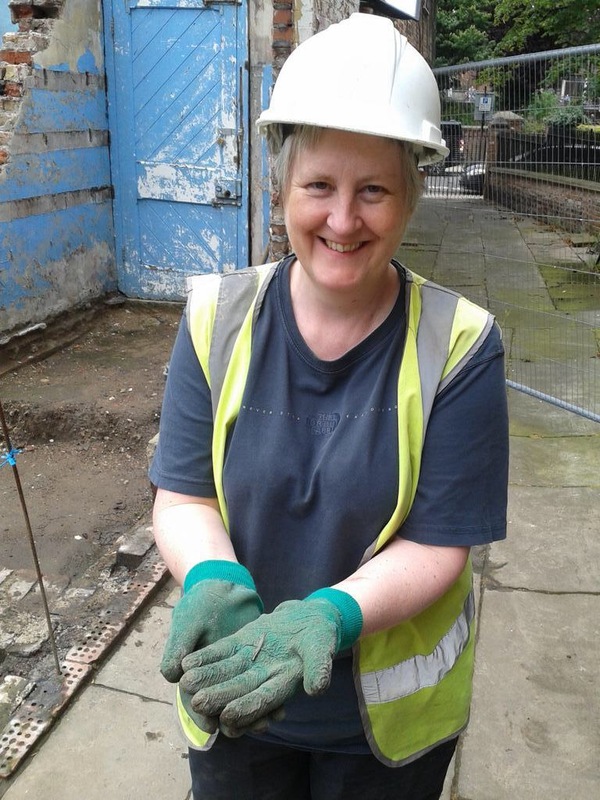 And so ended a thrilling week of archaeology on North Street. We normally have a stand-out find from the week, but week 8 left us with a whole collection! Recording a 19th century pit cut. Importantly, these artefacts add depth to our site story. From evidence of 18th century fashion favoured by the occupants of the rectory to tantalising clues of what Roman, Viking and medieval archaeology lies in store below us; our understanding of what people were using, consuming and doing along Church Lane has grown considerably. Personal possessions like Alan’s spindle whorl and Kaye’s glass ring, bring us that bit closer to the people that lived and worked here. 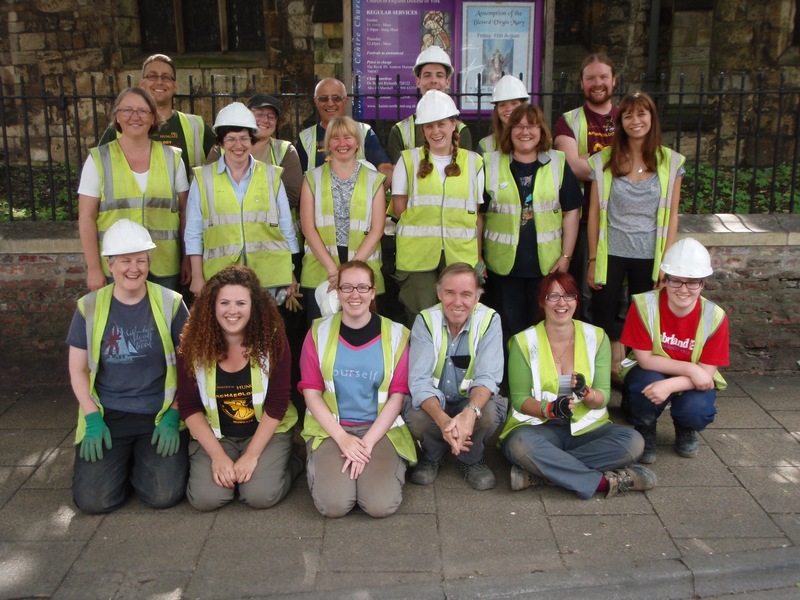 Thanks as ever must go out to our ever changing team of trainees and placements for their continuing work on site. 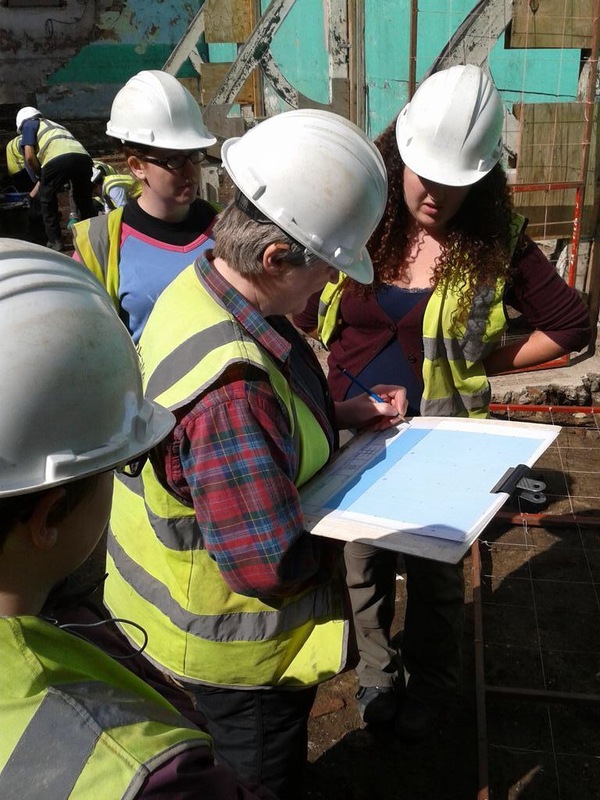 The quality of recording has been tip top and new excavation skills have been put to practice with an expert eye. Congratulations must also go to our placements Gus and Craig, who have now begun working with us as professional archaeologists on one of our commercial excavations! 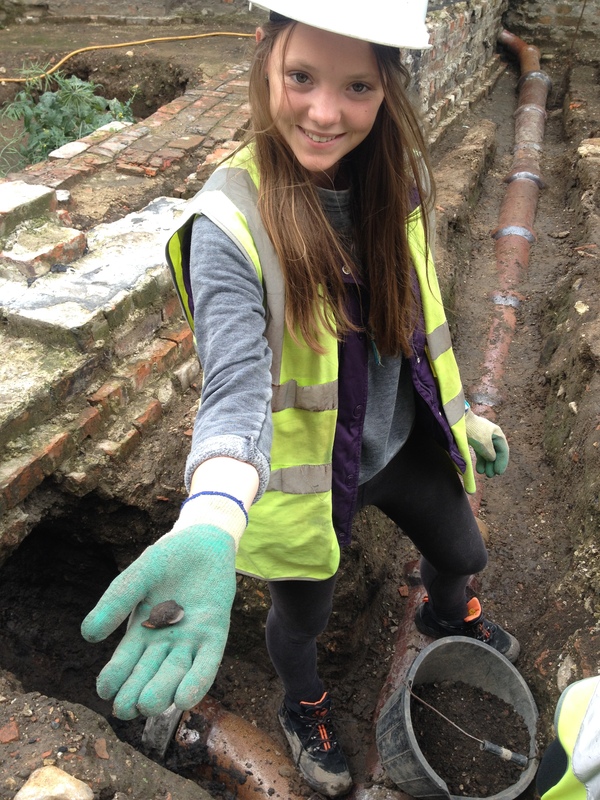 The experience gathered by our placements can prove a great stepping stone into professional archaeology. Next week, we will work to read an earlier chapter of the trench’s story and welcome back some familiar faces from the glory days of Hungate. It should be good fun and maybe, just maybe we’ll have another bonanza week of finds!